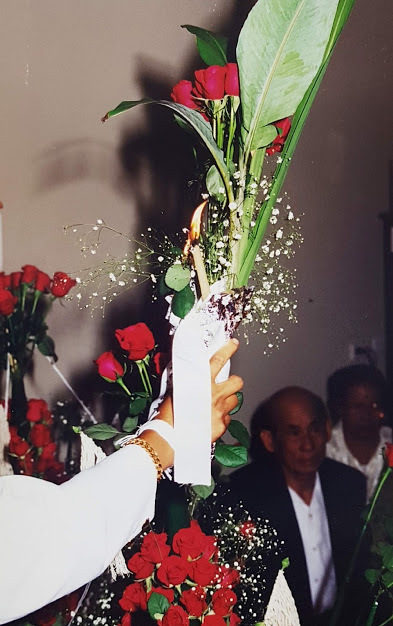 The ritual known to the Lao as the Phithi Souane or Phithi Baci is a ritual to call back, welcome, propitiate and unite the khouane with the physical body. It is the ubiquitous of all Lao functions and celebrations, and integral part if Lao family life. It can be held for a farewell, welcome, birth of a baby, birthdays, house warming, job promotions, harvest, new car, marriage and a New Year celebration. The Soukhouane ritual is not a seasonal and does not follow any ‘official’ calendar of ceremonies and rites in Laos. Although this ritual is not unique to the Lao, it has been said that is a Lao ceremony ‘par excellence’. It contains an amalgam of the many religious and cultural traditions that have influenced Lao culture and it continues to adapt itself to political and cultural values. 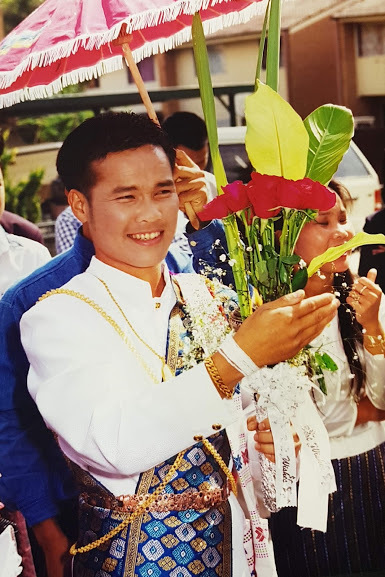 The ceremony celebrates, in essence, important family occasions as well as communal events of significance and in an integral part of the life of the Lao. It is a key element of Lao culture, being a microcosm of Lao values. The word Soukhouane is made up of two words: sou has connotation of ‘togetherness’, unity, sharing’, while the word khouane, signifies spirit, soul, guardian spirit; crown on the head of human or animal, or goodness, prosperity and happiness. The concept of a Lao person consists of both the physical and spiritual. To the Lao, the number of khouane in a person is imprecise, but it is believed that when the khouane leave the physical body, the person falls ill or become frightened. This condition can only be cured by the recalling and propitiation of these khouane and keeping them united with body for a time. The ritual ritual to call back, welcome, propitiate and unit the khouane with the physical body needs not necessarily be a soukhouane ceremony. The most elaborate ritual for this purpose is the ritual to call back, welcome, propitiate and unite the khouane with the physical body is the soukhouane, the ones being the phoukkhene, and sonekouane. The soukhouane ceremony is held whenever the totality of the physical, spiritual and psychological person needs to be protected, blessed or restored to the status quo. Psychologically, the soukhouane re-established the psychological equilibrium of the individual and provides him with its therapeutic value. Socially, the ritual is an occasion for social acceptance and respect for the individual, as well as an expression of kinship. Thus, a soukhouane is a ritual of recalling, welcoming, propitiating and biding the khouane to the physical body of the quest of honour in order to re-establish the psychological equilibrium and strengthen the spiritual well-being of the person while making a cultural, social and political statement about the person’s position vis-à-vis his/her worldly surrounding. A gift to entice the khouane and keep the khouane in the body, arranged around and as the phakhouane. One of the central ritual elements of a soukhouane ceremony is the phakhouane. 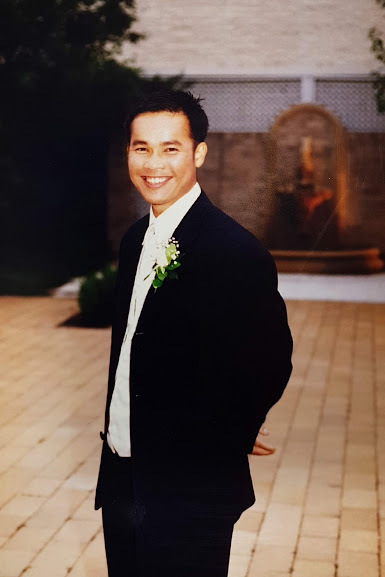 The shape, size and extravagance of the phakhouane is very much dependent on the memory and experience of the family involved and, to a much less extent, on the personal preference of the quest of honour. As well, the worldly situation of the family may influence the size and the extravagance of the decoration and the accompanying paraphernalia. 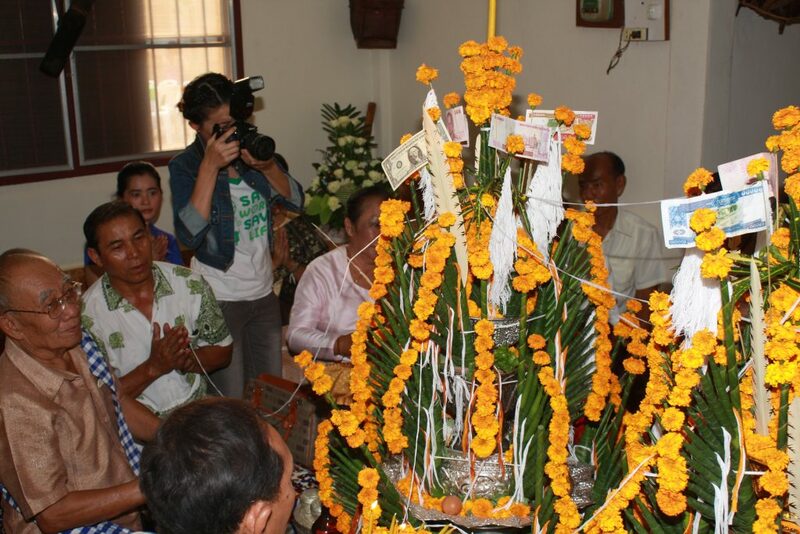 The phakhouane has a very important role in the ritual: as a symbolic offering to the assembled gods and a a welcome mat and gift for the returning khouanes, just as Lao hospitality usually welcomes a quest with a meal. On a worldly plane, it serves as a site for the family’s wealth, influence, taste and generosity. While there are regional variations in size and shape of the phakhouane, the center of the phakhouane is typically a conical ‘shell’ usually made of banana leaves of between fifteen and forty centimeters high, called a makbeng. The body of the makbeng is not a smooth cone as it is covered with folded banana leaves in the form of pointed scales increasing sizes from top to bottom. The makbeng for the phakhouane should have at least five khene arms, places around it. These arms are banana leaves rolled up in a long tubes attached to the body of the makbeng by pieces of white cotton threads. The top of the cone would be cut to make a hole to hold candles and flowers. These candles must be white (for purity), or yellow or better still made of bee’s wax (for wealth). They should also be sufficiently long to last the whole of the ceremony. The mekbeng is then decorated with flowers and some white cotton threads. For the most common phakhouane, there are four stages: the phapane, the silver O, the silver khane and the makbeng. The phapane is in fact a large late on pedestal, either in brass, aluminum or wood. It is used to raise the construction off the floor and to hold smaller containers with foods and fruits as offering. 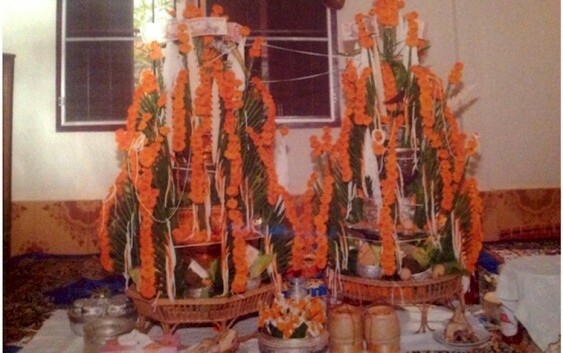 The preparation of the phakhouane is usually carried out on the eve of the day of the ceremony. For a wedding, the preparation would be undertaken by the female friends and relatives of the bride’s family, as well as her mother. However, the final decoration and placing of the phakhouane has to be done by auspicious ladies. There are quite a few taboos governing the sitting of the phakhouane. One of these dictates that once the preparation is completed, it must not be moved, lest moving it around would bring instability to the life of the quest of honour. Around the base of the bowl contains the phakhouane, and on the phapane itself, there is a series of small bowls containing symbolic foods, both savoury and sweet, boiled chicken on a plate, a even number of boiled eggs in a bowl, a sticky rice container, one complete hand of bananas, some water and alcoholic drinks. The rice container and the drink bottles must be opened just before the soukhouane proper to welcome the khouane. These food items symbolize fertility, and prosperity. Apart from the flowers on the makbeng, there is another important ritual element crucial to the soukhouane, the white cotton threads. There are two sorts of white cotton threads on the phakhouane. 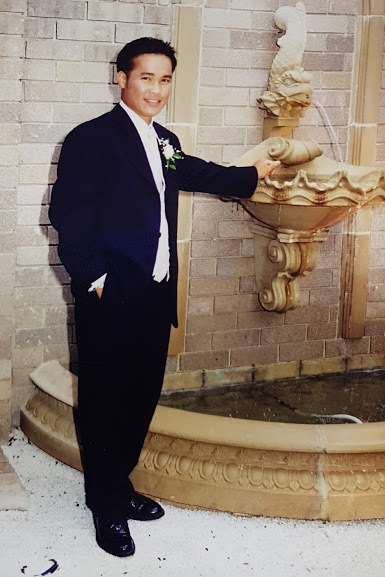 The longer pieces lead from the mophone and wind around the phakhouane, serving as ‘conduits’ to transmit the blessing from mophone past the phakhouane where the offering as assembled and to the quest of honour. Prior to the beginning of the ceremony, the mophone would give these long pieces to the quest of honour. The mophone would hold the other end of the same piece in his hands on a praying position while conducting the ritual. The other sort of white cotton threads are for tying around a person’s wrists and double knots in the middle to hold in the blessings. They are arranged on skewers stuck in the hole left by the scales on the body of the phakhouane, interspersed with flowers as decoration. Traditionally the threads must be white. After the ritual, these strings are tied around the wrists of the quest of honour and any other people to whom one wishes to give blessings. One is supposed to keep strings on for at least three days, and not to cut them off with a sharp implement. During the tying of these threads friends and family would show unity and support for the person having their wrist tied by holding the arm being tied or other parts of the person’s body. Others can join in this act of support by touching someone else who has the physical contact with person. This show of support is a crucial element of the soukhouane ritual, and it is one of the few occasions when physical contact between male and female is not regarded as taboo. The tying of the threads symbolizes the reinforcement of the body’s strength, an act that restores bodily as well as spiritual and social equilibrium, essential for well being and happiness. It is a way of binding khouane within the boundary of the physical body. How do these threads become ‘sacred’? During the ceremony, the mophone invokes the power and magic of the gods and the guardian spirits, seeking ther blessings. The threads, which should have knots on the middle to contain these blessings, thus appear as receptacle of an exterior magical power that make them different from ordinary threads ad give them meaning and value accepted, respected and understood by the participants of the ritual. The soukhouane is the key cultural word that connotes and denotes the attitude, the thinking and worldview of the Lao people. 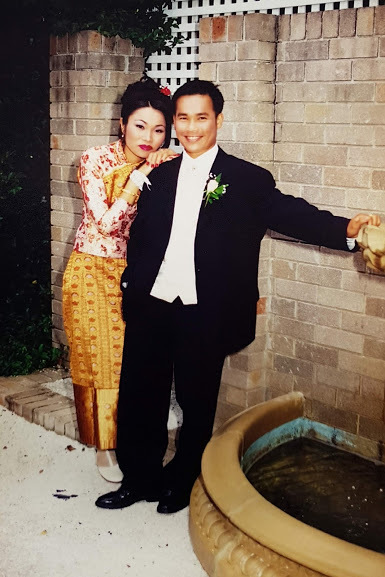 To many Lao, it is the true maker of the Lao identity: every Lao person, regardless of gender, must and will have a soukhouane at one stage or another of his or her life. The ritual of soukhouane serves to harmonise the individual and his psyche, his society, the supernatural and the universe. It makes a person feel good, loved and wanted after hearing the ritual invocation, receiving lots of cotton threads around one’s wrists and attention from all ceremony participants. This psychological good feel0good helps to induce physical well-being. To the Lao, the performance of the soukhouane evokes the history, the mythology and cosmology that have existed since the halcyons days of their ancestors. The soukhouane helps to bring about spontaneous memory of long-held tradition, of happy times and good omens for the future. Furthermore, it speaks of the joys of the present and mundane occurrence like feasting and celebrating the auspicious occasions or to strengthen oneself in time of crisis. The soukhouane has become for the Lao a mechanism through which the Lao maintain links with and represent the past: maintaining and continuing their identity and tradition.